Searching for reliable and accurate information about prepaid funeral plans can be frustrating. With so many providers trying to sell you their funeral planning services, it can be difficult to know who you can trust for impartial advice. Your search stops here! 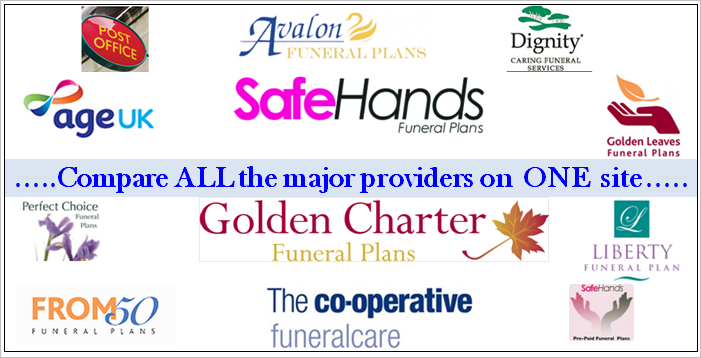 At Saxon Wills and Estate Planning we compare all major UK funeral plans in one place. Prepaid funeral plans allow you to pay for the funeral of your choice, in advance. It can be paid for in one single payment or in monthly instalments. The alternatives are funeral insurance or life insurance policies, or for the funeral to be paid for by relatives, or directly from your estate. There are Five main ways to pay for your funeral. This can vary according to the provider, so you need to check the small print carefully. Generally, the low cost plans only cover the costs of the funeral directors, and the additional mandatory fees also known as ‘disbursements’, such as the Minister, doctor’s fees, crematorium fees, etc which aren’t included in the plan. A company that appears to have a low headline price most probably does not include the disbursements. (usually around £1000). Should you decide that one of the companies that we can arrange a plan with is the best for you. 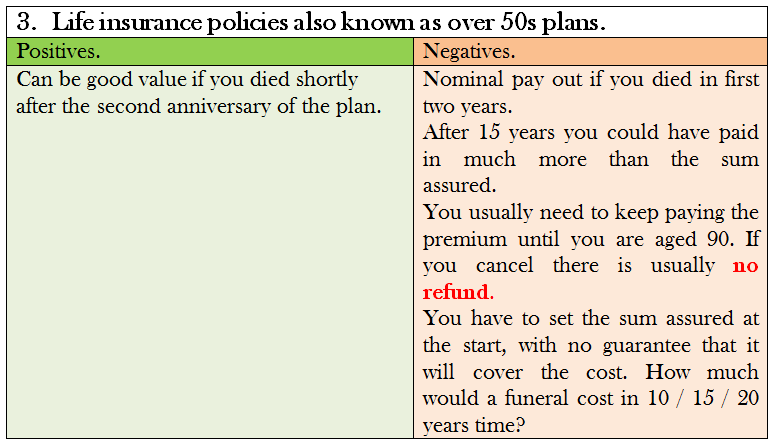 We will provide an estate planning package at a discount of 50% on selected*8 Estate planning products. When planning a funeral you need expert advice to guide you through everything you need to think about and ensure that every detail is taken care of. At Saxon Wills and Estate Planning, we believe in providing you with a transparent and compassionate service. If you’re looking to buy a prepaid funeral plan, you should also be considering making a Will, and be aware of the additional elements that may be needed to protect your estate – Property Protection Will Trust, Lifetime Interest Trust, Asset Protection Trust or Lasting Powers of Attorney (LPAs), for example. That is why we offer up to 50% discount on our Wills and estate planning services when you buy your funeral plan from us. To make comparisons of prepaid funeral plans easier, we include all major providers – including ones we don’t have any connections with or receive commission from. We believe you need the right plan to meet your needs. So, if you decide to purchase a funeral plan that we cannot provide, we’ll still give you a 25% discount on our estate planning services. Choosing a funeral plan can be very confusing because of the jargon and terminology used. As a guide to assist you in narrowing down the plans you want to look at, we’ve arranged them into four groups. As all companies have a list of elements considered essential for a funeral, we’ve decided to concentrate on the differences to help you decide which plan will be best for you. Choosing a funeral plan can be very confusing as different terminology is used by different companies. One may call their lowest level plan “Basic” another “Standard” or at the higher end one may call it “Superior” another “Premium”. We have arranged these plans in to four groups. This is only a guide to assist you in selecting a couple of companies at which point you need to compare their specifications. For example one company’s standard coffin may be the same as another’s quality coffin. All the companies include a long list of elements in their service that it would be assumed was part of a funeral. We have, therefore, not listed these in our tables so you can focus on the important differences not items that all plans include. 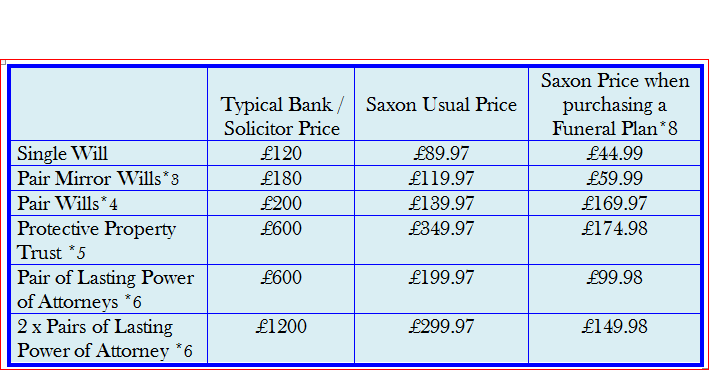 (The Safe Hands Direct deals are the minimum legal requirement service please see details) these can be seen in the individual company specification sheets. 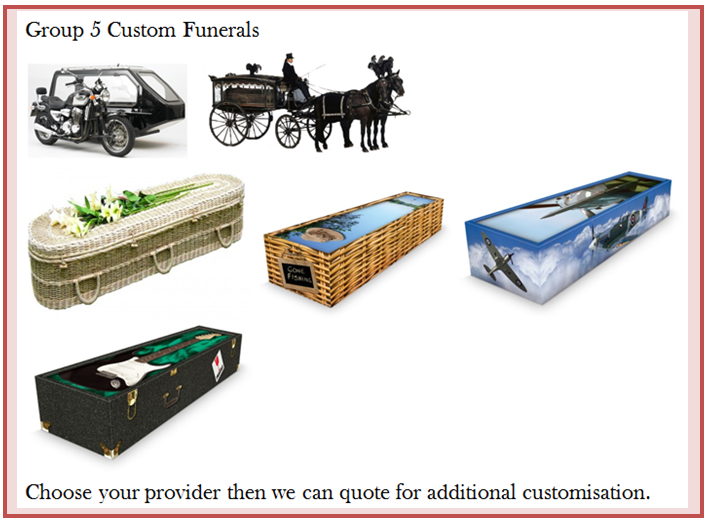 Coffins vary in terms of quality. Before making your final choice, please refer to the provider’s literature. Disbursements. The cost of a funeral is broken down into two components – the funeral director's fees and the disbursements, which are mandatory items like the Minister’s fees and crematorium costs. 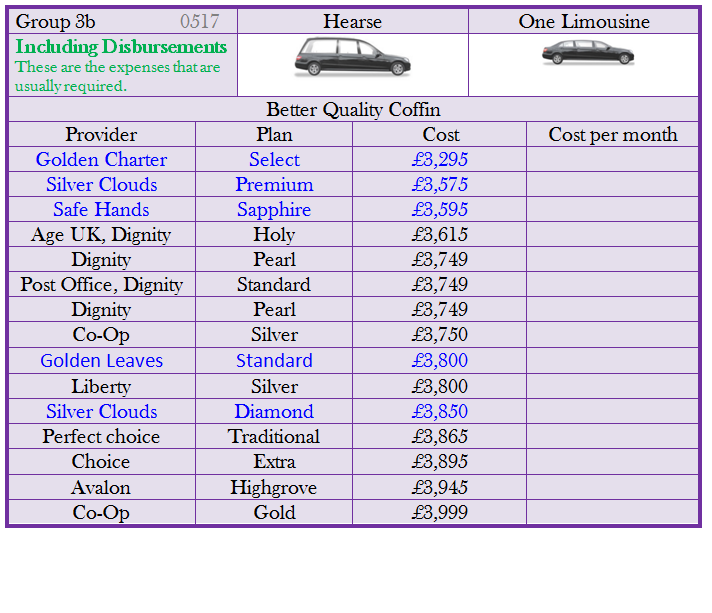 We’ve listed plans that cover everything, along with those that just cover the funeral director’s fees. Burial. All plans listed are for cremation. Burial is an option, however, the cost is usually fixed by your chosen cemetery. We advise you to make a choice based on a cremation plan and then your preferred provider can provide exact figures for burial. 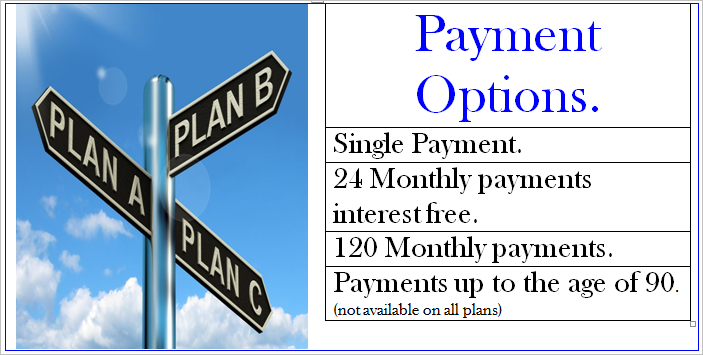 Cost per month is based on the longest term available for that plan. We have quoted as cost per month as that is how you will be paying. What does estate planning me to me? ......It's not just a Will but also protecting your estate for your children!! 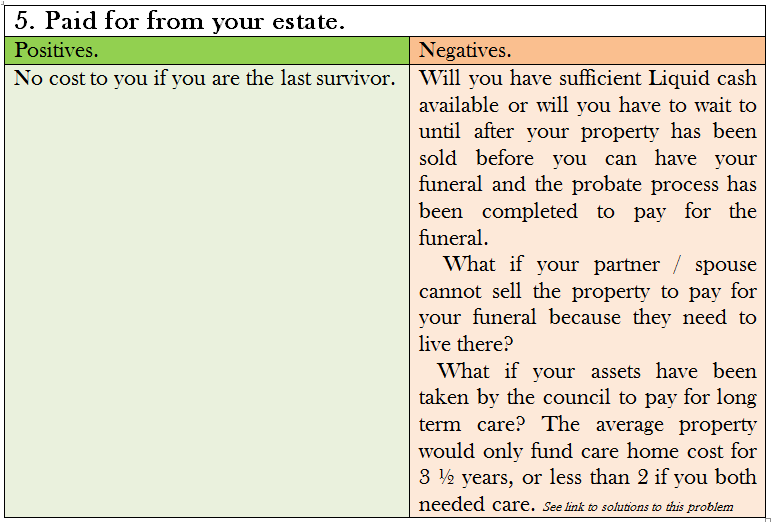 You are most probably aware of the basic functions of a Will. Did you know that without a mention in Will stepchildren do not inherit? What most people are unaware of is the additional trust that can be included. Children’s Trust Control the children’s inheritance until they are 25. Disabled children’s Trust Control the children’s inheritance for life. Both these trust also mean that their inheritance does not affect their entitlement to benefits. Flexible Life Interest Trust. Has many uses a common use is if you have remarried you want your property to pass to your children but you want your 2nd Wife to have the uses of the property, there are many ways this type of trust can be setup. Property Protection Trust. This protects half of the property from being accessed for care home fees. All the above only come in to effect after death. There are other Trusts that can be set that start protecting immediately these offer the best protection from care fees providing they have be set up early. Lasting Powers of Attorney. This give authority to a trusted person to take care of your affairs if you have lost mental capacity ie a stroke, dementia etc. Business Wills did you know that a personal Will may not give your executors authority to deal with your business affairs. 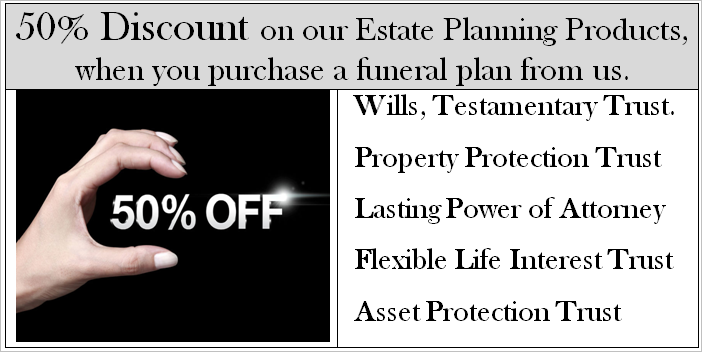 If you purchase a qualifying funeral Plan from us we will discount our already very cost effective services by 50%. (This can be transferred to another family member). If the Plan is purchased within 30 days of first enquiry. Once you’ve chosen the plan you’re interested in, click on the link through to the provider’s website. If your chosen plan is one we can supply for you, you’ll then be entitled to a discount of up to 50% off our other services. If you need any assistance or have any questions, please don’t hesitate to give us a call on 01406 430 541 or fill in our contact form if you’d like us to get back to you. competitive range of estate planning products. *6) Lasting Power of Attorney (LPA) includes a LPA Health & Welfare and a LPA Property & Finance together with the application forms completed. 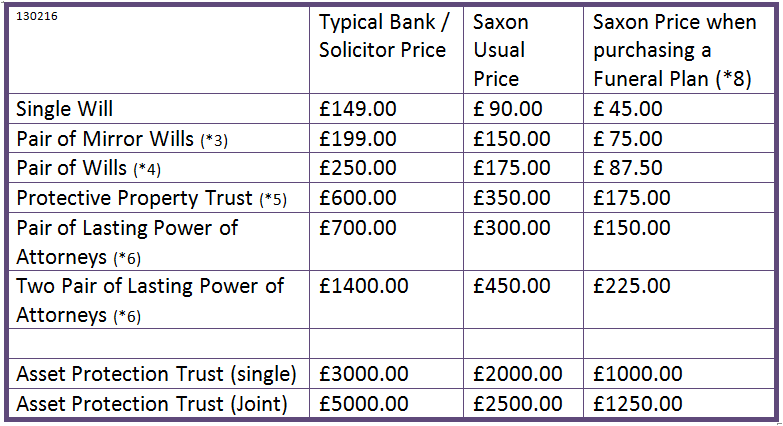 It does not include the Ministry of Justice registration fee of £110. Registration does not have to be completed immediately. Price only applies where we are also producing the Wills. *11. Discount is in ADDITION to any other discounts or offers. What to do next, having looked through comparisons, choose the plan or plans you are interested in, then click on the link and view the company site. If your chosen plan is one we can supply, you will then be entitled to 50% discount* (Safe hands direct plan 25% discount) on our already competitive range of estate planning products. These offers are available when you purchase a prepaid funeral plan through us (one off payment or via instalments plan). (This does not include the Safe hands Direct Deal*6). This is a fully advised service not just a form sent out to you to complete. 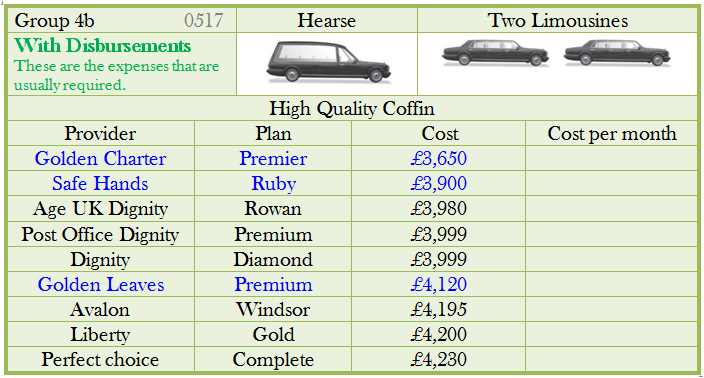 Should you decide not to purchase a funeral plan at this time but want to go ahead with the above package we will give you a 25% discount from our standard prices. Your money is held in an Independent Trust. So if the company ceases trading your funds are fully protected. The information provided on this website is to simplify the process of choosing a prepaid funeral plan. Before making a final decision, you should check the funeral plan provider’s website for further information. We are not responsible for the content found on third party websites.